Have you seen the latest art installation in the Theater District? 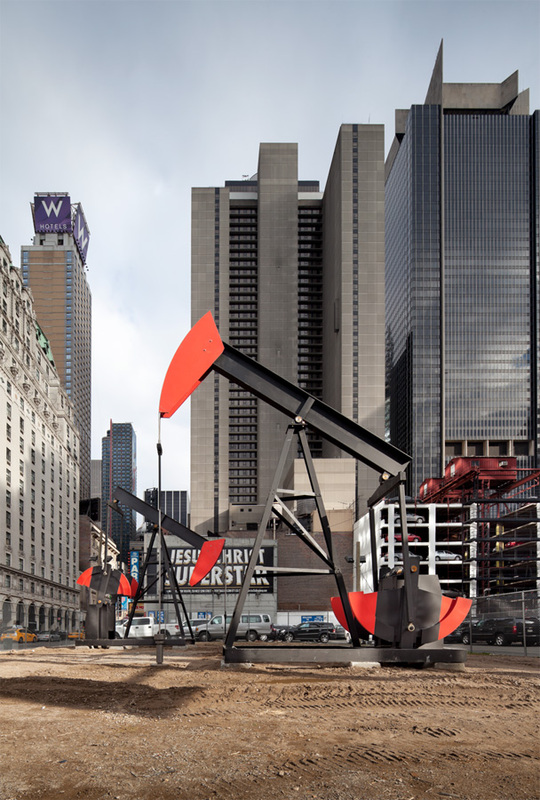 It’s Josephine Mecksper’s Manhattan Oil Project – two 25-foot tall oil pumps churning away 4 hours a day (twice a day) weekdays and 8 full hours each weekend. Go to the undeveloped land on the southeast corner of Eighth Avenue and 46th Street and bring your friends (and camera) before it’s gone. Sponsored by Yvonne Force Villareal’s Art Production Fund, which produces hard-to-produce artist installations, this one had special help from Sotheby’s and The Shubert Organization, which know a thing or two about mining riches in Manhattan. Is it actually pumping oil? Feel free to stand there and answer out-of-towners questions on that one. This entry was posted in Art, Museums, Theater and tagged art, culture, events, marketing, museums, theater by mssusanb. Bookmark the permalink.